"Equinor ASA tops European projects investment list"
GlobalData’s latest report, ‘Top Oil and Gas Companies Planned Projects and Capital Expenditure Outlook in Europe – Equinor Leads Capital Spending Across Oil and Gas Value Chain’, reveals that Equinor ASA tops the companies European spend list with an estimated capex of US$12.4 billion expected to be spent on 24 projects. Gaz-System SA and Snam S.p.A. are the second and third biggest investors with US$5.8 billion (30 projects) and US$5.6 billion (25 projects), respectively. With Petoro AS in fourth position with US$3.8 billion (seven projects) and Lundin Petroleum in fifth with US$3.7 billion (3 projects). In the upstream sector, Equinor ASA has the highest new build capex commitment of US$11.9 billion (21 projects) between 2018 and 2025. Gaz-System SA will be the major spender in midstream sector, primarily focusing on oil and gas pipelines with a capex spend of US$5.1 billion to bring 29 planned and announced projects online by 2025. 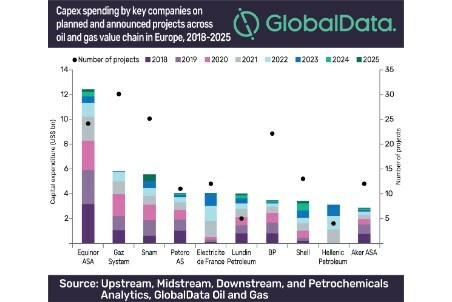 In the gas storage segment, Snam S.p.A. leads with estimated capex of US$2.5 billion to be invested in 14 planned and announced gas storage terminals by 2025 and International BV will lead with capex of US$0.7 billion expected to be spent on Maasvlakte, an upcoming liquids storage terminal in the Netherlands. Grupa Azoty SA is expected to lead the petrochemicals sector to 2025 with a capex of US$748 million during 2018 - 2025. Grupa Lotos SA is at the forefront of gas processing with US$1 billion allocated to the Baltic gas processing plant in Poland. In terms of liquid storage, H.E.S. International BV is in the forefront with capex of US$0.7 billion expected to be spent on an upcoming liquids storage terminal, Maasvlakte, in the Netherlands.